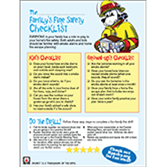 All-new this year, Sparky®'s Family Checklist is a fun and easy way to prompt the whole family to check-up on their fire safety smarts...make sure they have an escape plan in place...and learn how to do a family fire drill. It's an easy (and inexpensive) way to teach kids and adults about fire safety in the home. Do you know the sound a smoke alarm makes? Do you know what to do if the smoke alarm sounds? Do you test the batteries in the smoke alarms once a month? That's not all! Sparky's "Do the Drill" shows families how to practice a family fire drill in five easy steps to keep everyone safe and protected!